Top of the Cheops Pyramid! 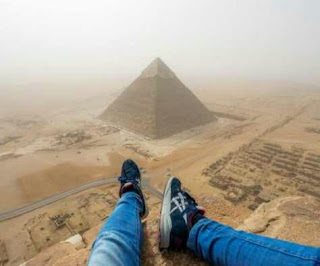 GIZA, Egypt --A German 18-year-old shared footage of his daring climb to the top of Egypt's Great Pyramid of Giza, which took him only 8 minutes. Andrej Ciesielski posted a video to YouTubeshowing highlights of his 8-minute climb to the top of the pyramid, which attracted the attention of police. "I think the police shouted in Arabic to come down but I just listened to music and enjoyed the climb," Ciesielski told Buzzfeed. "I went to the police station for maybe one hour. They asked me many questions about why I did this, but they let me go." The teenager posted pictures taken atop the landmarkon Facebook.